Cut 56 equal lengths of the bulky matching yarn for fringe. Use a crochet hook to pull loops under the cast on and bind off edges. Put ends through the loop. 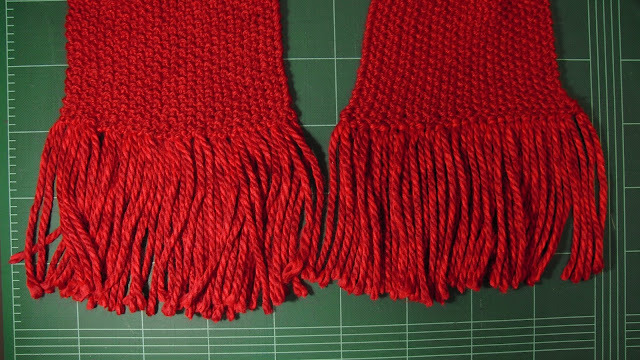 Align ends and pull fringe tight. Length of knit part: 65"
Width after stretching: 5 1/2"
Fringe cut length, whole strands, in bulkier yarn: 11 1/2"
My mother liked the striped seed stitch scarf I made but she wanted hers to be solid red, longer, and narrower. I had a skein of Lion Brand Heartland Redwood, some 100% baby alpaca in Ruby, and some red mohair. She liked the 100% acrylic. 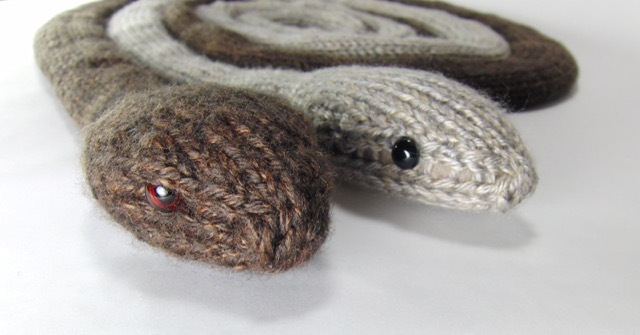 That's the same kind of yarn I used to make the rat snake. I showed her how wide that fabric was if the stockinette wasn't rolled up. She said that looked right. 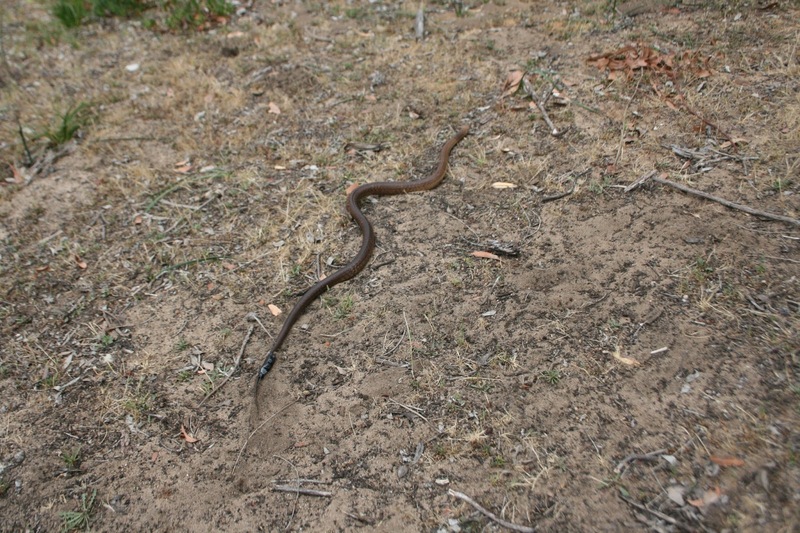 The snake came out about 7' long. That stuff comes in big skeins. I hoped 142 grams/251 yards would make a pretty long scarf. 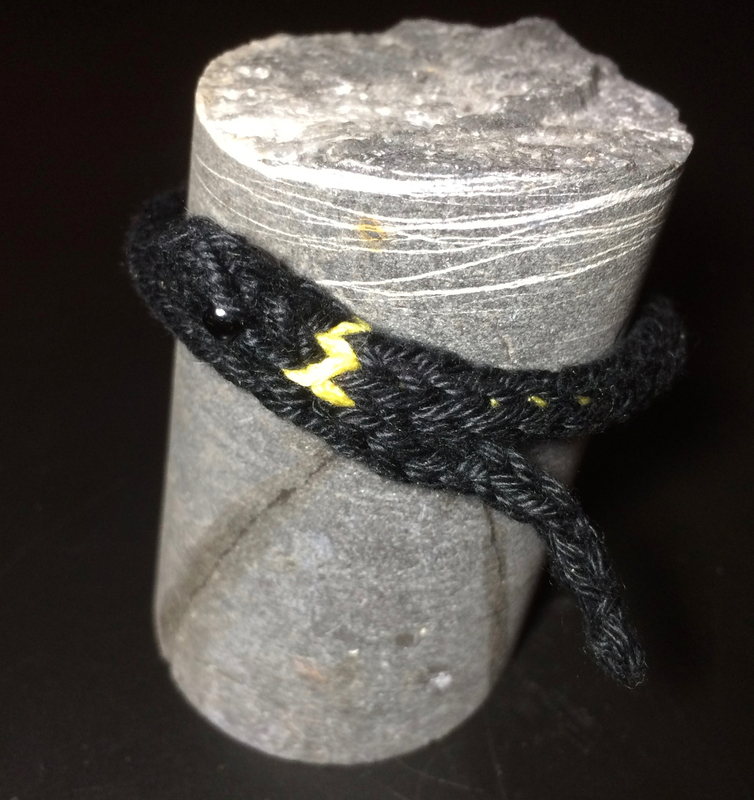 I cast on 27 stitches with my new favorite slip knot cast on and started seed stitch with some 5 mm size 8 aluminum DPNs. This yarn recommends 5.5 mm size 9, but my vintage aluminum DPN collection only goes to 8. 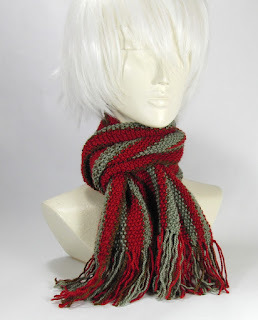 Aluminum is best with this 100% acrylic yarn. Bamboo is right out. Sticks to this yarn like velcro. My nickel plated needles work but I prefer a short DPN to a cable needle for a narrow scarf. I use little silicone stoppers on the ends when I knit. 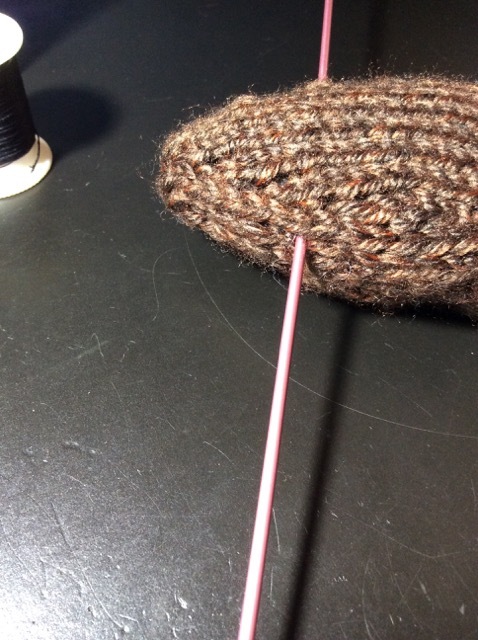 I pull the stopper off the empty needle and stick it on the other end of the one in the work when I stop. Keeps everything in place until I pick it up again. Edge. No slip stitches. Just knit both sides. I didn't do anything special for the edges. 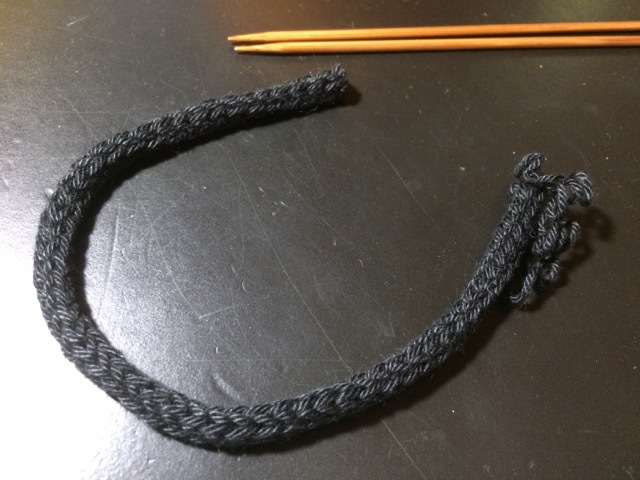 I just ended both sides with a knit stitch, turned, and started again with a knit stitch. I had to knit from the front and purl from the back in combination knitting but I got the hang of it immediately. The scarf still on the needles was 54" long and 6 1/2" wide. My mother really wanted it long enough to double it and pull the ends through. I used this same color yarn for the O of a Valentine's door decoration. But it was the Thick and Quick version, not the worsted weight. Still, same color. I had a small amount leftover. It could be fringe. So I simply cast off in pattern instead of doing a grafted slip knot bind off. It will be covered up, no need to make it match the cast on. I measured how much I had of the Heartland Thick and Quick Redwood, divided by 26x2, the number of fringes I would need, and got 12" per fringe. That'll do. You need about 18 yards of yarn to make this much fringe. I had 20 arm lengths at 32" each, total of 640" with an error bar of at least half an arm length. 640 / 52 = 12.3" got rounded down to 12" as a starting point. 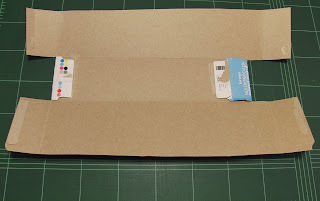 I measured a cereal box and snipped and folded one side section to make a 12" place to wrap the yarn. I wrapped the whole length of yarn to be sure I would get 26 wraps (each wrap has two sides). I was about 3/4 of a wrap short. I curled the box over to pull the yarn off, then cut the box more and folded it up another half inch and wrapped it again. I was trying to do it loosely to not stretch it because I thought that would make it uneven. That gave me one piece of fringe extra. Perfect. I cut the yarn at both ends to make my 53 pieces of fringe. 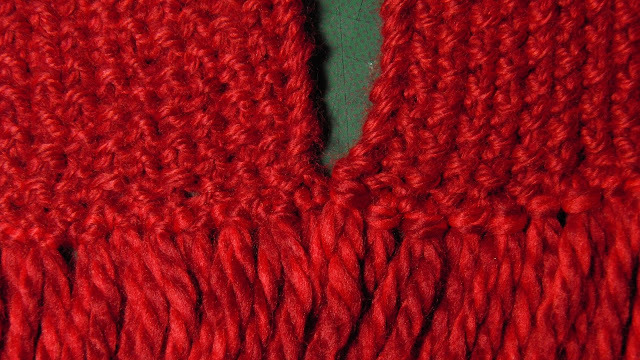 I used a crochet hook to pull the center of each strand under the cast off stitches going between the columns. Then I pulled the ends through the loop, lined them up, and pulled it tight. I failed to take any pictures because I didn't realize it would make a good contrast blog post to the hard-to-make scarf at the time. 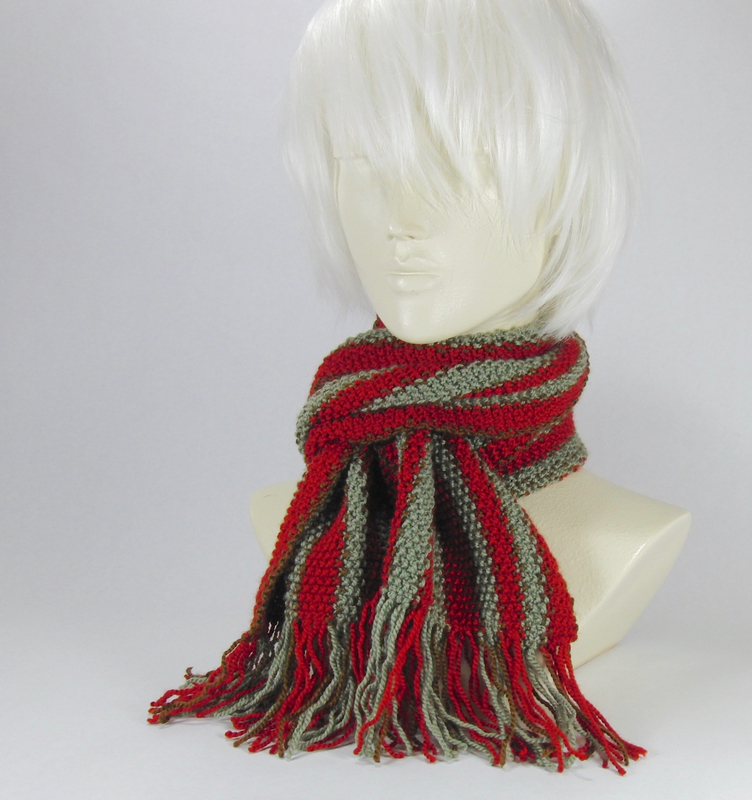 The bulkier yarn makes the ends of the scarf flare out a bit. This turns out to be cute when worn because it doubles over the fringed part like a sophisticated ruffle. I made up a new pattern for a slouchy hat for a geek teen this week. 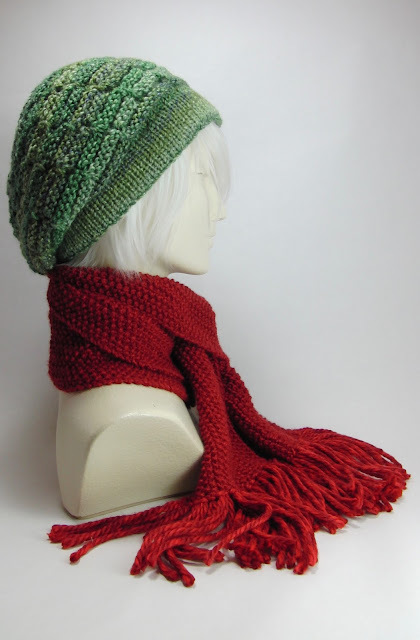 I started a matching ribbed scarf already, but when I put the red scarf on the mannequin who was already wearing the green hat I remembered red and green are complementary colors. Too bad Christmas ruined that fashion option. I think it looks fetching together. 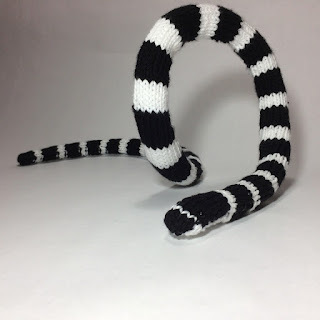 I just realized I'm following up all these posts on snakes with a scarf with the initials SSSSS. I may be in a rut. 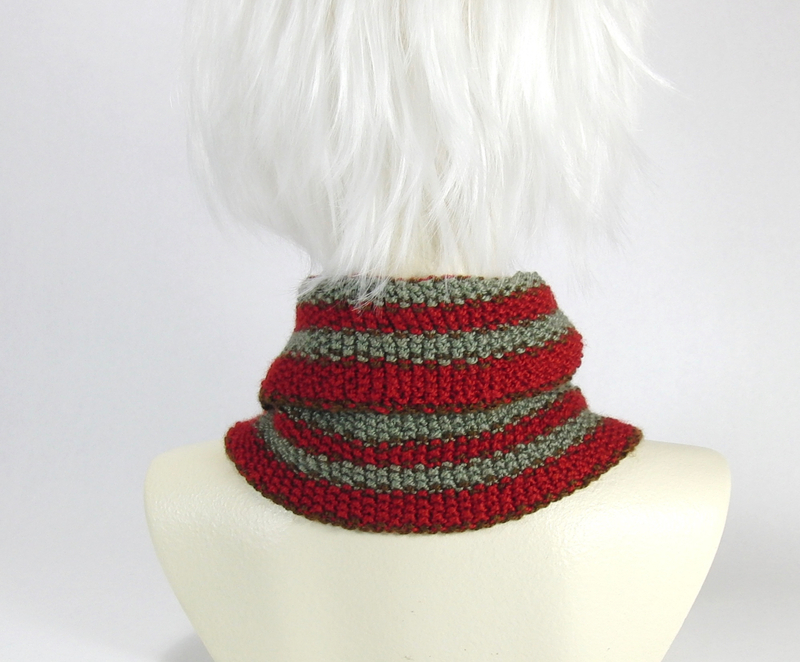 I posted a 9 page PDF to Ravelry with full details of this pattern. Buy Now for $5! 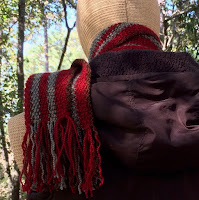 The PDF includes still photos for the slip knot cast on, a full chart of the exact row count for the scarf pictured above, and formulas written out to duplicate the spreadsheet linked below. 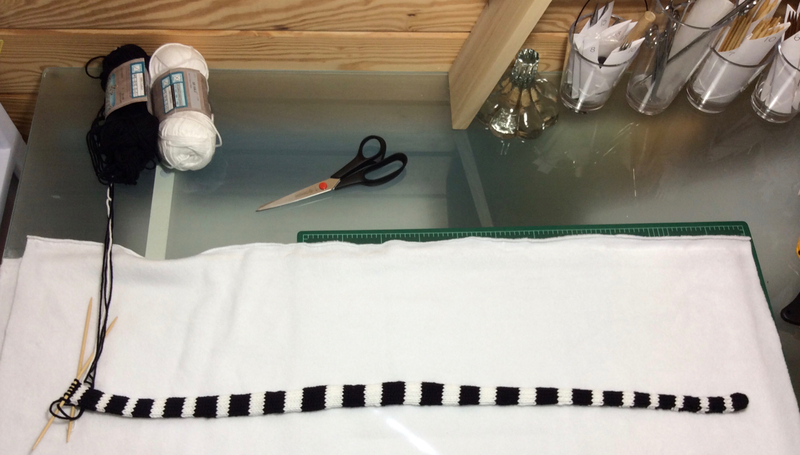 Also there is a scarf length comparison chart to help choose how long to make your scarf. This is my promised follow up to my circular seed stitch scarf post where I suggested seed stitch in the round as a good way to practice combination knitting. 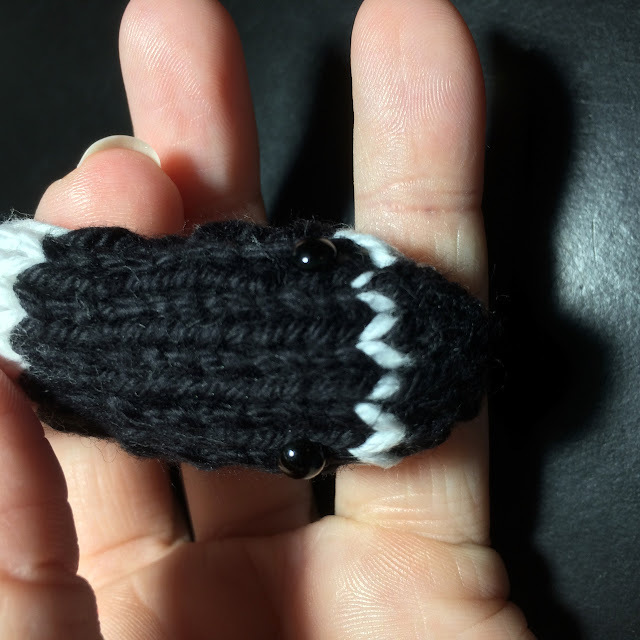 There are pictures in that blog for how to read the stitches for seed stitch knit in the round. When I finished the black, sage, and gray scarf I was disappointed in the stretchiness of the edges. I wanted it to be evenly stretchy all over, with the edges just as stretchy as the middle. I made up my mind I was going to make that happen. 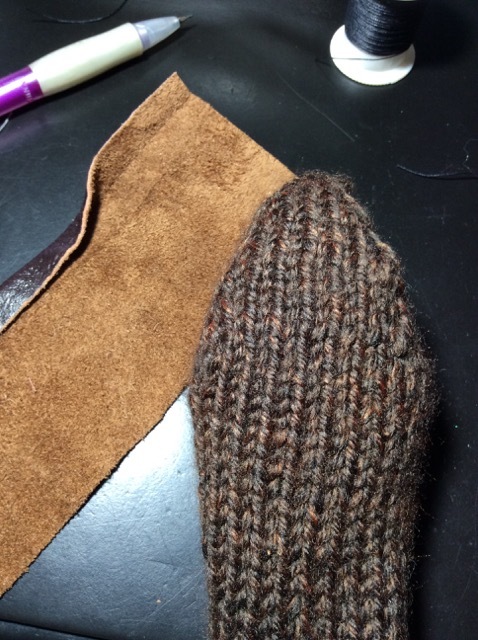 I finally found a way to make a cast on that was just as stretchy as seed stitch — the slip knot cast on. There aren't many videos for how to do it. The one with hand motions I could actually copy was such terrible quality I made my own. 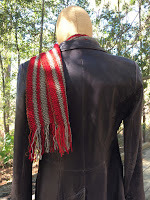 The first seed stitch steeked strip scarf I made, the black and gray one, came out 104" long. 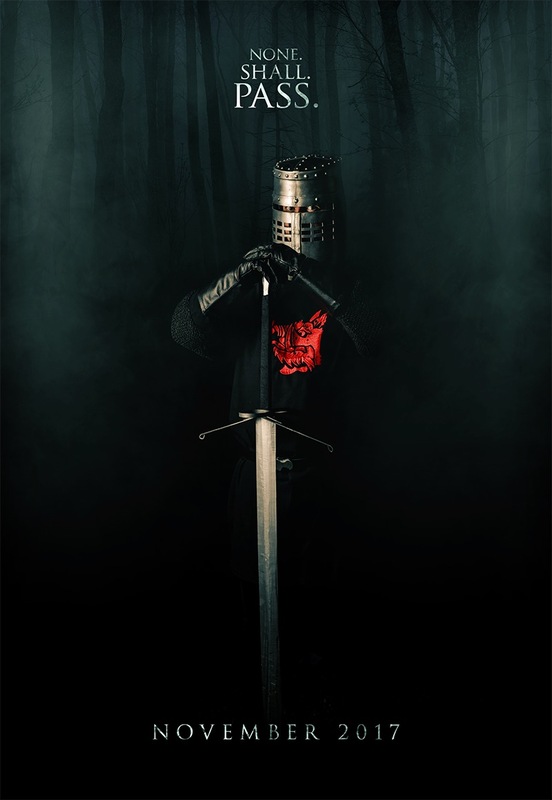 I gave it to The Black Knight who is a big fella and he loves that it is long enough to double over and pull the ends through the loop and have the ends still come to his waist. For a small person like me that's way too much scarf. I wanted about 72". Based on the long one I figured I needed 220 stitches to get that. Well, it only came out to be 54" long. Same needles, same yarn. I guess I was just so uptight about current events I knit much tighter than normal! As such my scarf came out shorter than I meant for it to be. I don't know what number of stitches to suggest. I did a gauge swatch and did the calculations and I was just wrong. At 3.2 stitches per inch I got 5 inches of fringe on each end. At tighter gauge the fringe came out shorter. To predict your results you'll have to unravel the gauge swatch 8 stitches and measure. 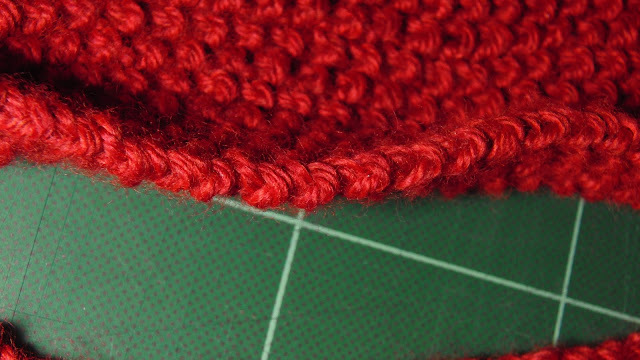 If it looks too short add stitches to the cast on and leave more than 16 stitches to unravel in the steeked section. 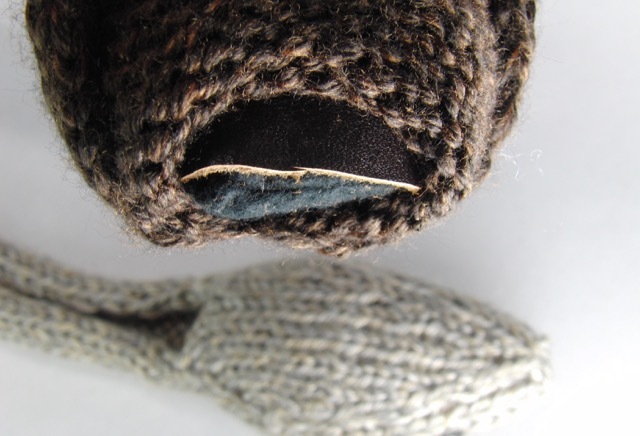 This is a good time to figure out how much yarn you will need to cut to sew the graft. I started mine with 144 inches. This yarn doesn't twist up so it worked. Some other yarns it might be a lot more frustrating to sew with a length like that. I actually ran out about 12" short. It might be best to plan to work in another length of yarn part way through. I used a sewn join for this 100% acrylic yarn, meaning I placed the ends overlapping about 1/2" and sewed it together with needle and thread. It's the only join I had to do in the whole project. I shot video of it but then forgot to add it to the edit. If you have wool yarn then a spit splice would be great. Because the graft is not the very edge it won't be as noticeable as if you had to a yarn join in a traditional bind off. I managed to get the explanation of the graft worked out in the video when I was in the middle of the graft. Then I came back to the camera for the end and I went into opposite land and start purling when I'm saying to knit and knitting when I'm saying to purl. I think my brain is defective. My muscle memory will take no verbal cues. Let's see if I can describe it in words. I think 99 out of 100 people would rather watch the video, but who knows? 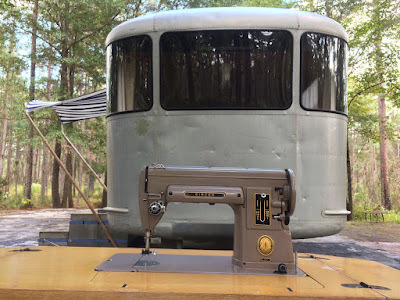 There could be some kind of disaster where YouTube stops working but miraculously Blogger still functions and somebody's life could depend on being able work a seed stitch graft with nothing to go on but my blog. I am a big damn hero. Start with an equal number of stitches on two needles. For this instance the back needle is the slip knot cast on in contrast yarn. I put on a few extra slip knots because it's better than not enough. Start by working a set up stitch on the back and front. Look at the first stitch on the front needle. If it is a purl stitch then the first set-up stitch is through the first stitch on the back needle purlwise. Insert the needle from right to left and pull through. If it is a knit stitch on the front needle then work the first stitch on the back needle as a knit. Insert the yarn needle from left to right and pull the yarn through. Leave the stitch on the knitting needle. Work the first stitch on the front needle as whatever it is. Be sure the working leg is in the front. If it is a knit stitch it should be facing the front already. Insert the yarn needle from left to right and pull through. If it is a purl and you purl underhand like me, flip the stitch on the needle first, insert the yarn needle from right to left, pull the yarn through purlwise. Keep the stitch on the needle. The set-up is equivalent to the second half of the following steps worked on two stitches on each needle at a time. Now hold a DPN the same size as your knitting needles over the yarn between the needles. Go to the back needle over the extra DPN and work two stitches. Look at the second stitch on the front needle. Working the back needle stitches, insert the yarn needle in the direction indicated by the second stitch. If you purled the set up stitch this means you go into the first stitch on the back needle knitwise and drop it off the knitting needle. Then go into the second stitch on the back needle knitwise and leave it on. Pull the yarn through. 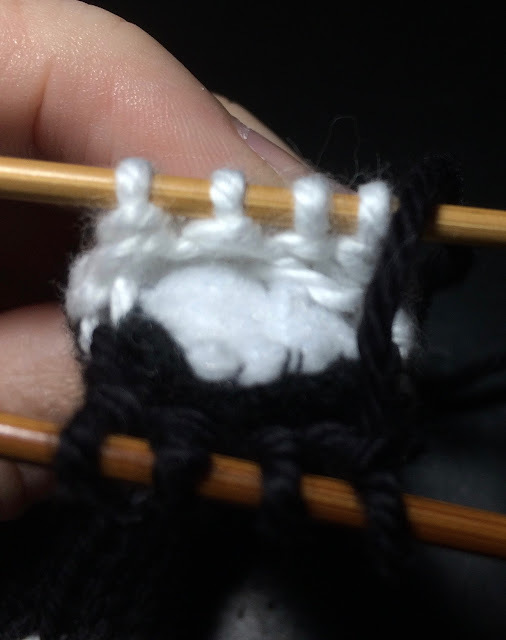 If you knit the set up stitch then the second stitch on the front needle is a purl and you purl a stitch and take it off, then purl a stitch and leave it on. 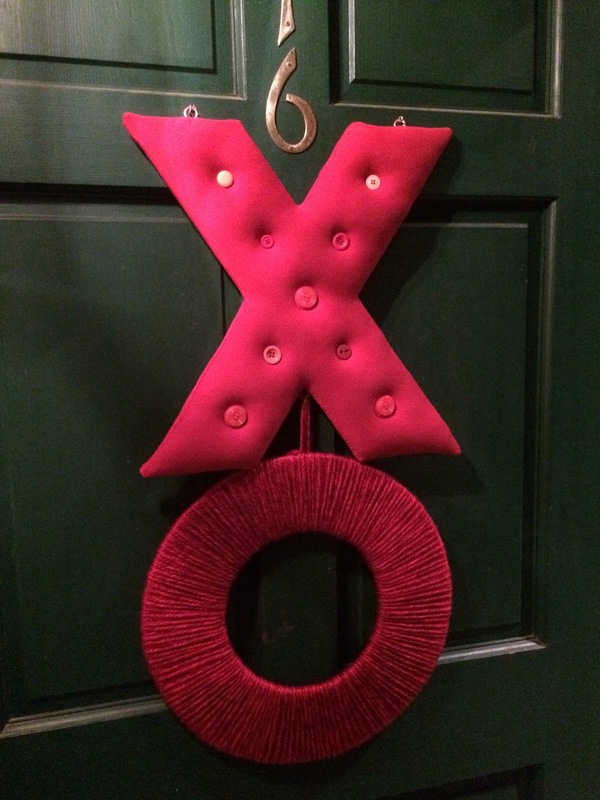 I abbreviate this into a chant "purl off, purl on" or "knit off, knit on." Now hold the working yarn under the DPN and under the front needle. Work two stitches on the front needle the same direction as you just did the back. Look at the second stitch to confirm. Whatever the second stitch is on the front needle that is the way you work these stitches. Knit off, knit on. Or purl off, purl, on. Repeat this two stitch pattern for the entire graft. Go over the extra DPN to the back, go under the DPN when coming back to work the front. This will allow you to pull tight on the working yarn and get the tension perfect for the whole graft. Keep sliding the DPN along with the work letting the stitches fall off the back. It's just like a cable needle. It's only important for a few stitches near the ongoing work. The chant is a double repeat, starting in the back. purl off, purl on. purl off, purl on. knit off, knit on. knit off, knit on. purl off, purl on. purl off, purl on..." If only that worked for me. I have to look at the second stitch on the front needle every time. When I started this scarf it was summer. 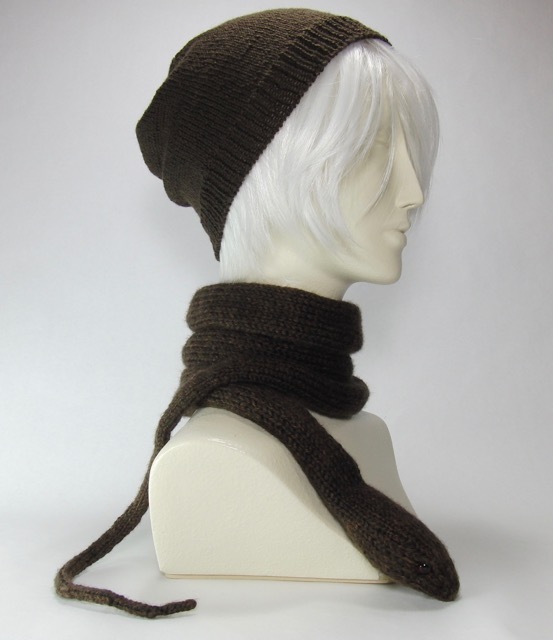 I thought, "Oh, this brown yarn will be just enough to make this coordinate with all my brown clothes." Then when I finished it I got out those brown clothes and it's not even CLOSE to the same color brown. I didn't even know brown was so hard to match! I'll probably wear it anyway. I knew that was a gross shade of brown. I'm kicking myself. Don't make my mistake. Hold your yarn up to your coat before you start! It doesn't match my brown hooded nylon vest either. I got this yarn on clearance a while ago and most of the good colors are gone. This red is still available but not the other colors. It is more of a formula than a yarn-specific pattern though. I am hoping somebody will commission one of superwash merino based on the sample in acrylic. Maybe some other obsessive compulsive knitter will try it in some pretty yarn and post photos on Ravelry. I hope! I just this minute realized I knit this on size 4 needles because "4-4,5" is written on the ball band. But nothing else on there is in US units. It's even a decimal comma, as if I needed more of a clue it's not US units. It's millimeters, not needle size. I feel much shame. Although the other reason I used a size 4 needle could be that I bought a size 4 needle for these cables for another project but I don't have a size 7. Oh well. I like it dense like that. It's so springy. But if I'd used 6 needles it would have been a lot easier to knit and longer. A commenter on Webs says it feels like DK weight to them, not worsted, so maybe that's why I went with the small needle. Point is, whatever yarn and needle combination you use is fine. If you want it as stretchy and dense as the one in the video go for smaller needles than called for. This helps it stand up on the neck I think. 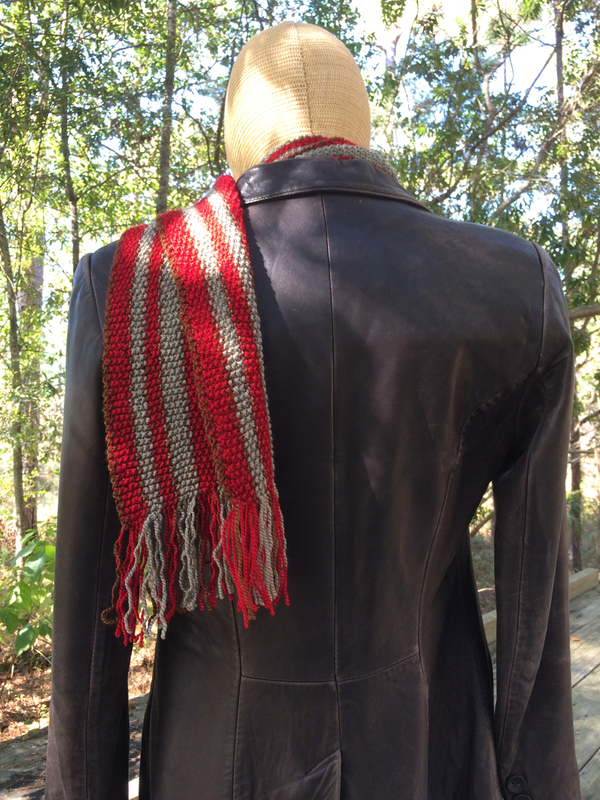 The needles I used for this scarf are Nova Platina interchangeables. I got them used on eBay. I like them for scarves better than the Addi Lace Short needles I use for hats. The join is smoother and they come in larger and smaller sizes. I've gotten extra cables and tips from Jimmy Beans Wool. The Addi Lace needles allow you to pull through different cable lengths for trying things on. These don't do that. 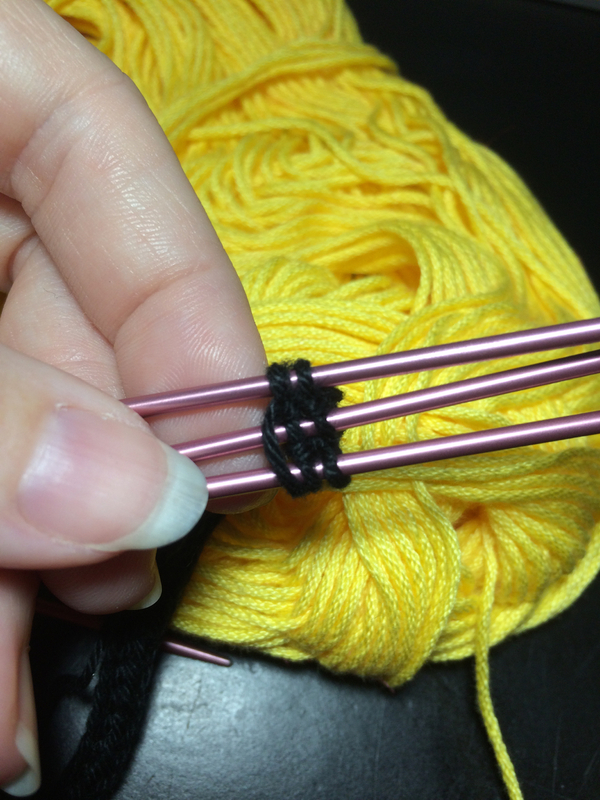 I cast on with a size 8 needle then switched down to a size 4 to knit the first row. 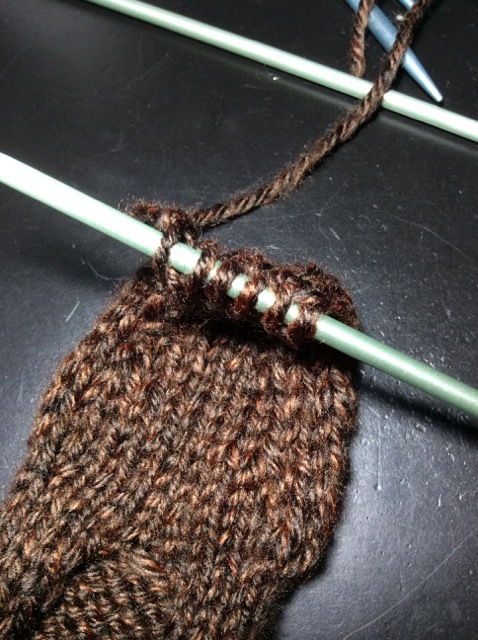 You have to experiment on your gauge swatch to be sure the needles you choose will make a sufficiently stretchy edge. I think the perfect match of my edges is partly a function of the too-small needle thing. If there were more yarn in every stitch there's more chance the edges would stop stretching before the body. Thank you for bearing with me for this long explanation. If you want to encourage me to do more of this buy the PDF on Ravelry. 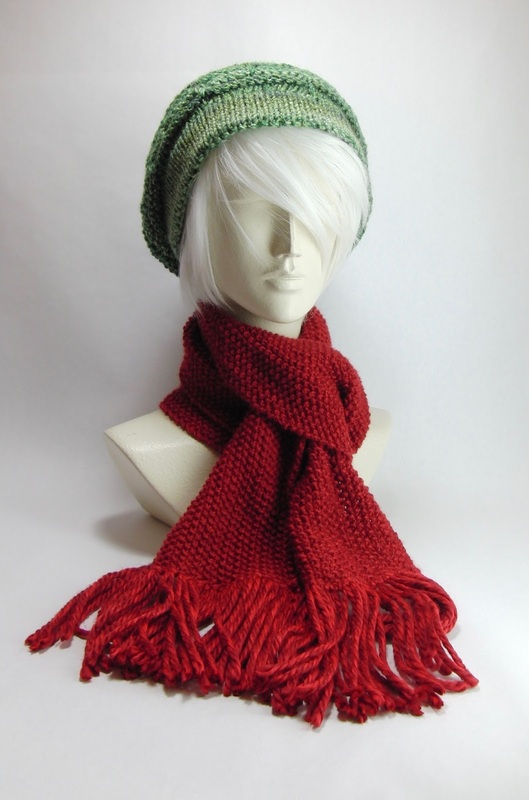 My knit version is made in 100% cotton worsted weight yarn. I knit with much smaller needles than what is recommended for this yarn to get a dense fabric. 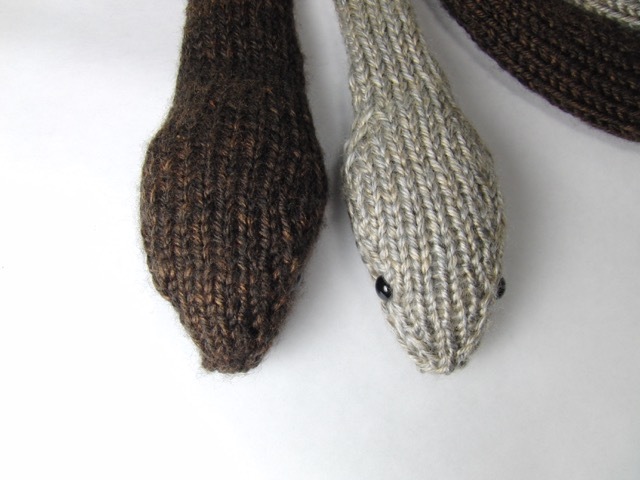 The ventral side of the snake is worked in reverse stockinette and the dorsal side is stockinette. It's worked in the round on double pointed needles. I made a spreadsheet and filled the cells with gray and white to picture how it was going to look and wrote the instructions out row by row as a checklist. After most of the snake is finished, cut a strip of white fleece fabric that rolls up to the right size to fit inside your snake. 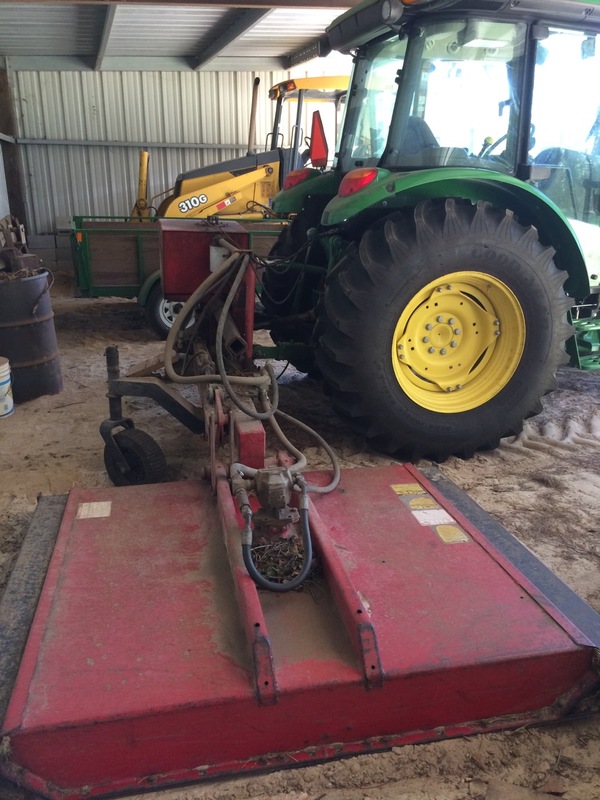 If the width of fleece on the bolt is wide enough you only need to buy 1/4 yard. 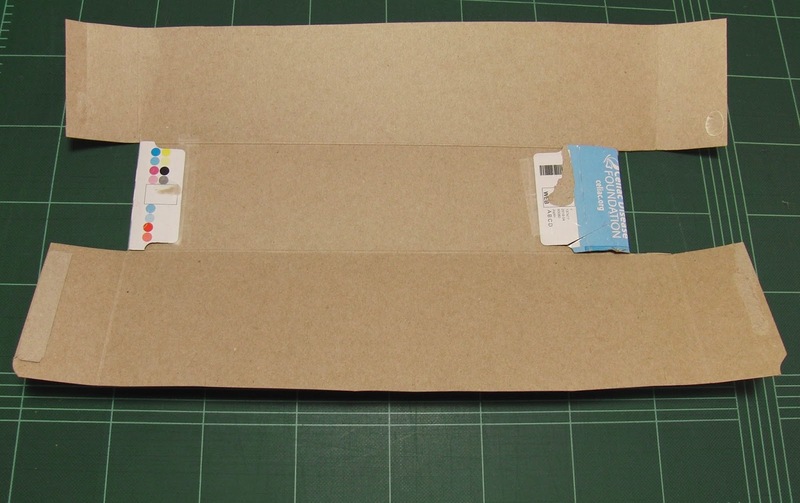 Cut a rectangle that rolls up to the right size to fit inside the snake. I cut off triangles to make tapered ends. 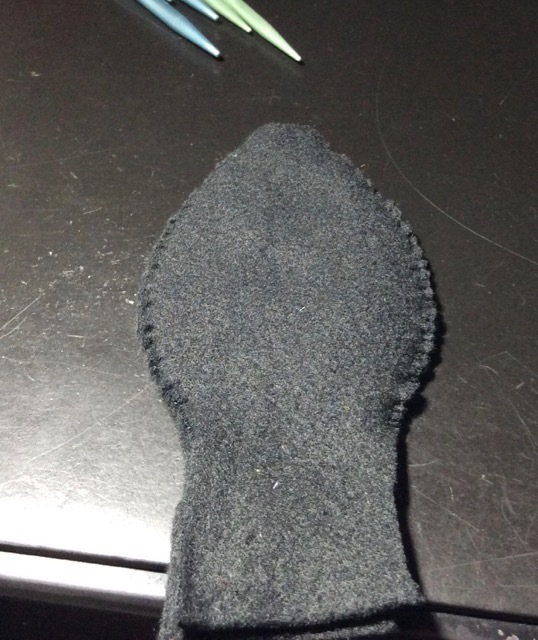 Sew a piece of nylon trimmer line inside the rolled up fleece filling. I tapered the filler piece by cutting triangles off the end so when I sewed the exposed edge I sort of spiraled around. Fleece doesn't unravel so you don't have to turn under the edge. I cut a piece of nylon trimmer line to go inside the fleece filler. Then I pushed it into the body. I finished knitting working around that insert. When I got almost to the end I cut the fleece and the cable and sewed some black fleece on top and closed up the fleece with needle and thread. 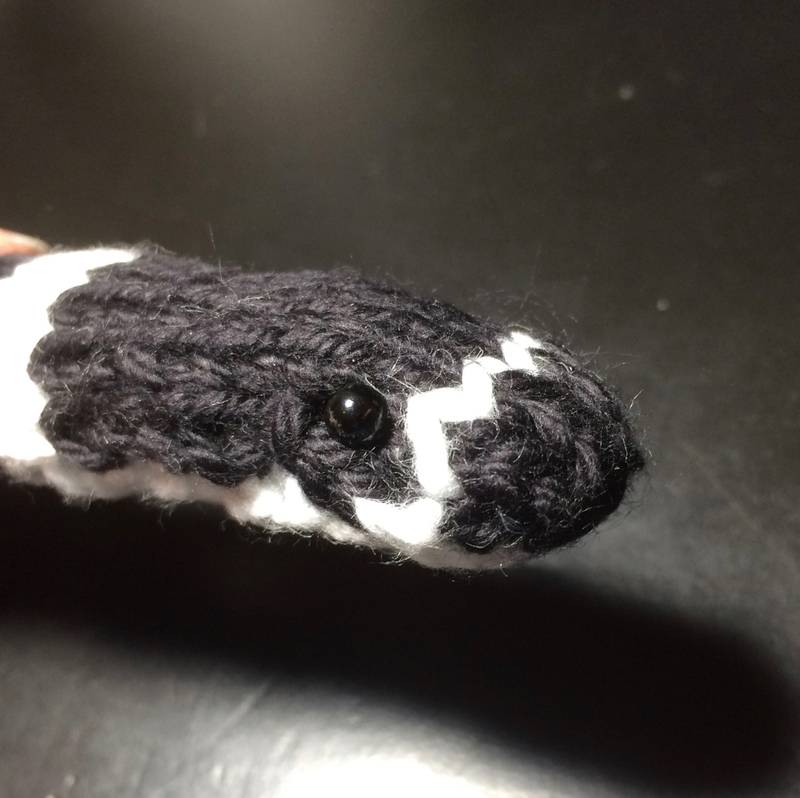 I finished by grafting the stitches together with black yarn to make the blunt nose. I worked out where they eyes should go just behind the white band on the nose. Bandy Bandy's have tiny eyes so I used 4 mm glass eyes from CR's Crafts. They're $0.70 for a package of two. 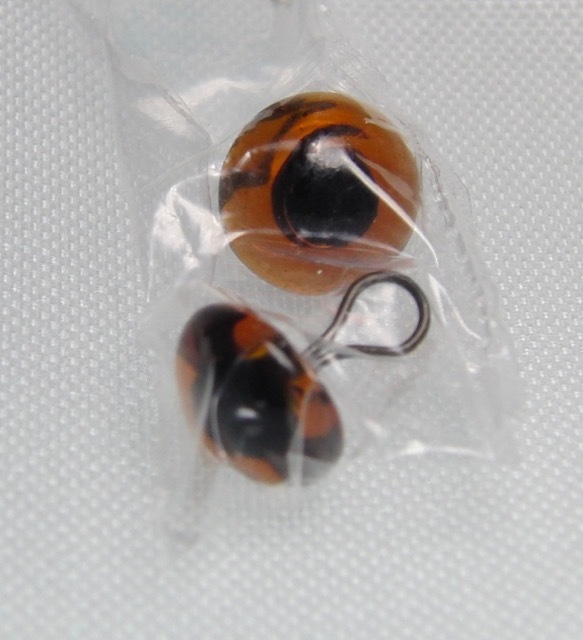 I bought them at the same time as those magnificent amber eyes for the Dugite scarf. These have a little wire loop embedded in the glass for sewing on. And sewed the eyes on. I used the needle and thread to be sure to secure the fleece filling inside the head so it wouldn't twist around. I decided to sell this pattern for $3. Here's the link to it on Ravelry. You can search Patterns for Bandy Bandy if you want to check it out later. Click here to Buy Now if you aren't a Ravelry member. What happened to October?! I can't believe I didn't write any blogs for a whole month. I must have been busy. The election results yesterday left me in a blogging mood. I wrote up my reaction over on Spasms of Accommodation. I was going to peel pears all day and make pear butter but I watched a Tom Scott video titled "A Brief, Personal Letter from America" that made me feel like working on my blog instead. He made this suggestion: "Make people welcome. Help people grow. Spend your time on constructive things." Pear butter is a constructive thing, but it doesn't help people grow. I'll get to it after I share some useful knitting tips. Looking at my photos library I see I did a lot of things in October and I remember why I didn't blog. I hurt my back and it was painful to sit at my desk. 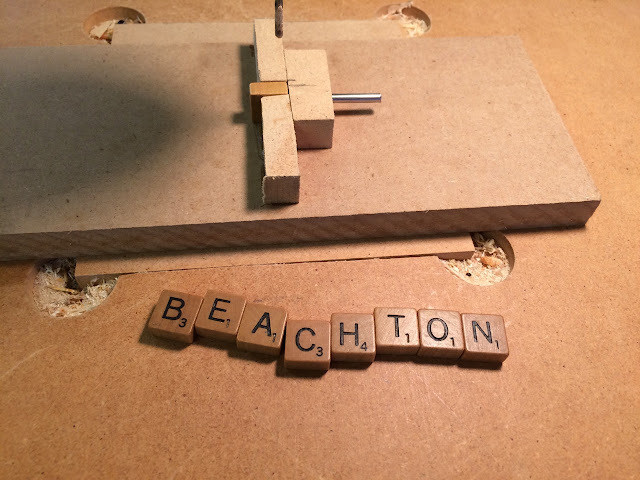 Early in the month I went to my dad's shop to use his table saw to rip a board to fix a signpost for a client. Digging up and repacking the dirt around the signpost the next day is how I hurt my back. 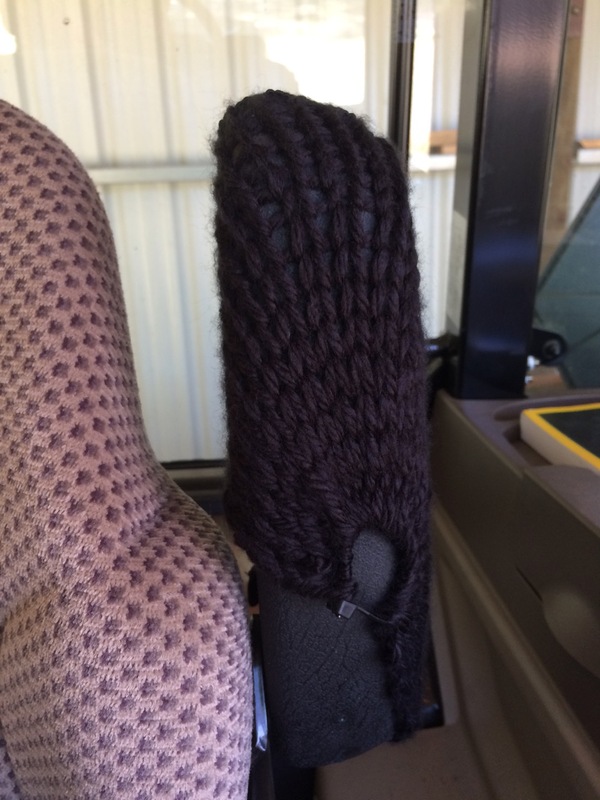 But while I was at my dad's shop he asked me if I could knit slipcovers for the armrests of his tractor. They are made of a kind of high friction rubbery vinyl and it hurt the skin of his forearms even through long sleeved shirts. I put some paper on the arm rests and cut out templates the shape of the top of the armrest and the sides. Back at my lab I cut out a piece of black fleece the size of the top template. I sewed some black eyelet trim to the fleece by hand. 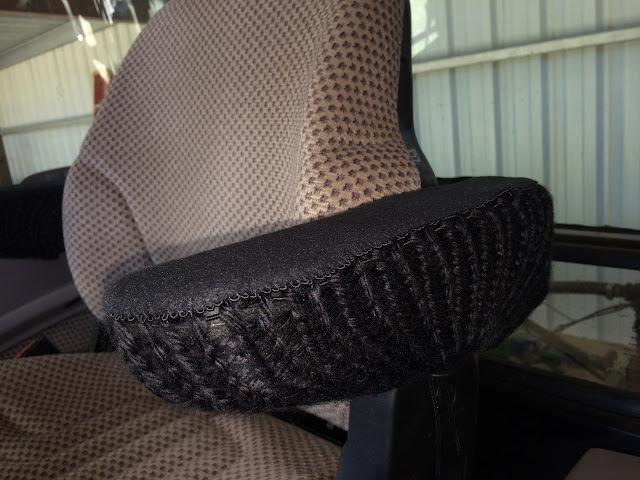 Then I used a knit picker to pull bulky black Hometown USA 100% acrylic yarn through the loops in the trim and put the loops on a size 11 cable needles, starting at the pivot point of the armrest. I knit back and forth in stockinette until I thought it was long enough. I found a bottle in the lab that was about the size of the side template. I stretched the knitting over it for test fit. Then I made another one the same way and took them back to my dad's shop. I used a cable tie for a drawstring, just run through the loops of the bind off. While I was at my dad's shop to install the slipcovers I used his drill press to drill holes in some Scrabble tiles I got on eBay. They're the small ones from Travel Scrabble and are slightly thicker than the regular ones. We made a jig to hold the tiles while I drilled them. I made the hole big enough to fit small ball chain through. I keep changing my mind what to spell out. I made another Cotton Cloche, this time in brown for fall. I used a 50/50 cotton acrylic blend. It was a bit lumpy but when I blocked it the shape came out nice. I blocked this hat on a mixing bowl. I took that necklace apart and added JO, XI, and ZA to QI. I like it better now. All the high scoring 2 letter words. Also in October I finished another snake, a Bandy Bandy. It's very cute. I want to make a stop motion video with it but I'm waiting for an idea to occur to me for a plot. I will write up the pattern one day. This snake has a piece of weed trimmer line in it just like the brim of that hat. Makes it so it can wave its body like a real Bandy Bandy. In October I got two new sewing machines. When I tried to sew that trim on the fleece for the tractor project my sewing machine broke. This irritated me. So I got on Craigslist and found one I wanted. But they didn't get back in touch until I'd already bought another one. Long story short, now I have both. 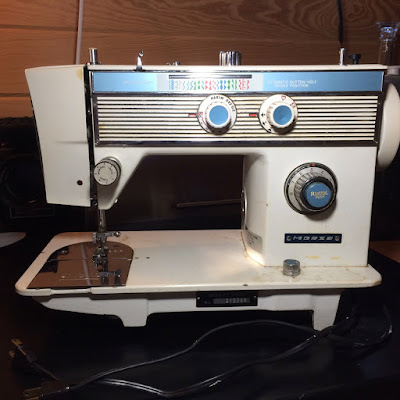 Singer 301 from 1951, same year as my lab. I hurt my back again moving the table that came with that second sewing machine. It was just in time for a job I could do lying down. My last big October project was a last minute Halloween costume rush job. 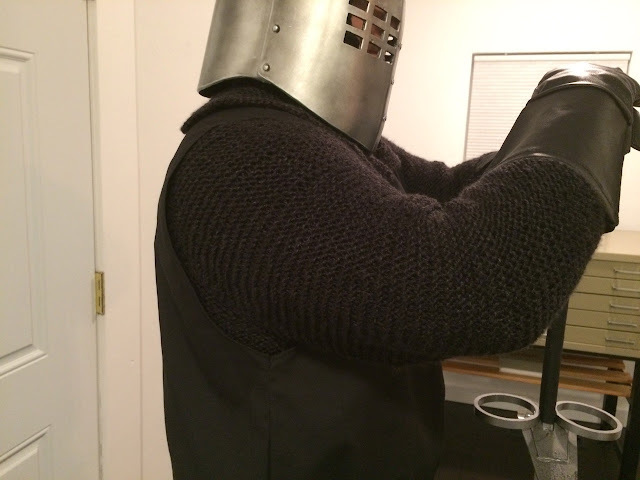 My friend wanted to be the Black Knight from Monty Python and the Holy Grail. He ordered some parts of the costume online. My part was the hood and cape thing under the helmet and the tunic that looks like chain mail. The costume in the movie looked like garter stitch to me. It took me a while to get the right yarn. I ended up with Heartland Black Canyon. I made up the patterns by eye. It turned out pretty good. I'll write up the pattern one day to share. UPDATE: I figured out another way to do the eyes today, May 20, 2017. See the end for details. I got an icord mill recently after reading about them on TECHknitting. I quickly found out that the most efficient way to use that thing is to go ahead and use up a whole skein of yarn once you get started. I had some DK weight mercerized cotton that rubbed black dye off on everything. So I decided to just turn the whole thing into cord. Then I washed the cord and made it stop bleeding. Now I can use it for stuff. I made drawstrings, eye glasses keepers, and then this cute little thing. It's stretchy enough to pull over your hand. Here's how I made it. 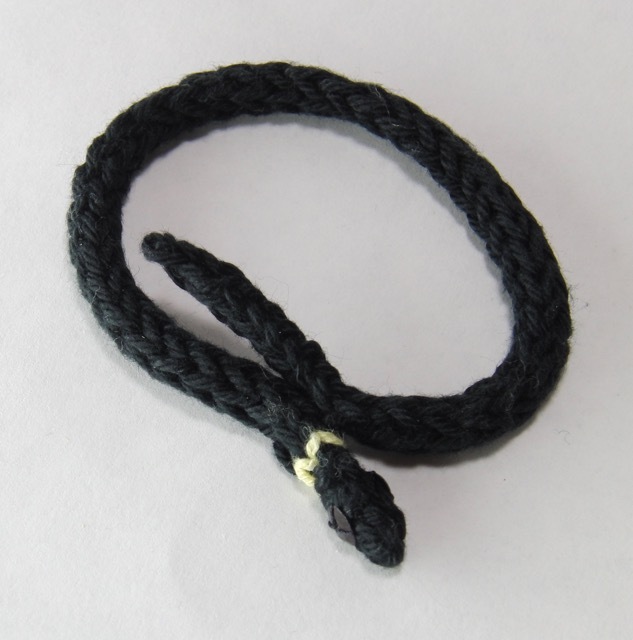 Start with a length of black icord from mill. I just held it up to my wrist and guessed how long to make it, allowing for overlap and unraveling. Cut a length long enough to pull yarn out of both ends to rework the tail and head end and still have enough to reach around a wrist. Mine was 8” after unraveling. Unravel about 19" of yarn on each end. Place live stitches on small DPNs. Start with the tail end. Pick out the cut yarn. unravel 19” of yarn. Put live stitches on needles (size 2 DPNS). Knitting as icord decrease to 3 stitches with k2tog on middle stitches. Knit a bit, then decrease to two stitches and knit a few more rounds. Pull yarn end through 2 stitches left. On other end rip back similarly and put the live stitches on needles. 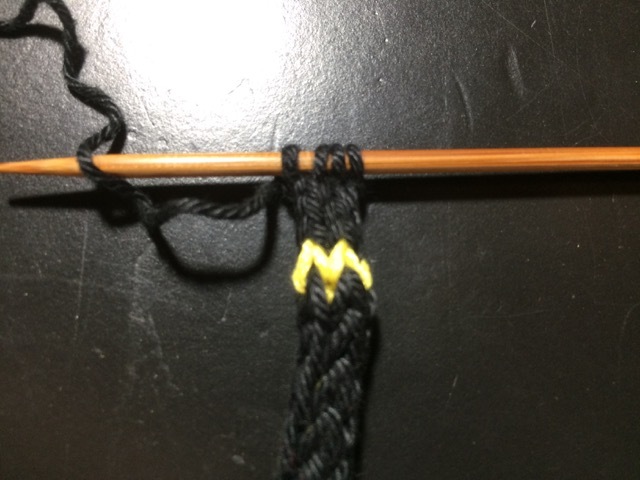 With some bright yellow yarn knit a single round. Tie ends together on back of the needle and pull tails into the tube with a yarn needle. Icord knit the black yarn 4 more rows. Thread the tail on a needle and pull yarn through all 4 stitches. 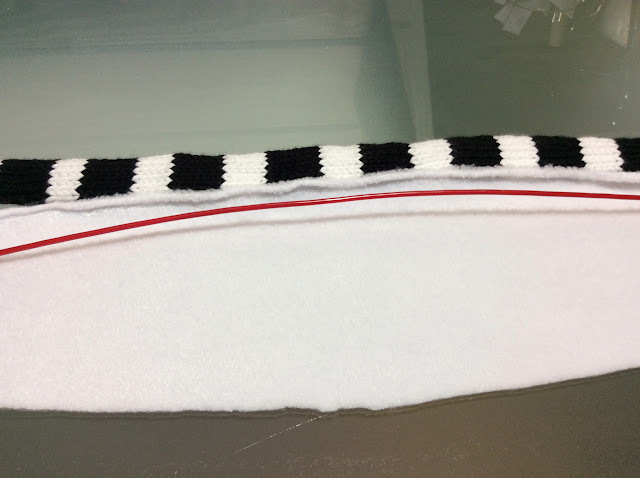 Sew the yarn tail into the bottom of the head to make it more head-shaped. Thread yarn tail at the tail end down an inch and sew tail to body just below neck ring to make into a bracelet. On the second one I made I didn't have any yarn tail left so I sewed it with the black thread from sewing on the sequin eyes. I sewed the bottom of the neck to the tail to cover up the color jog in the yellow yarn. 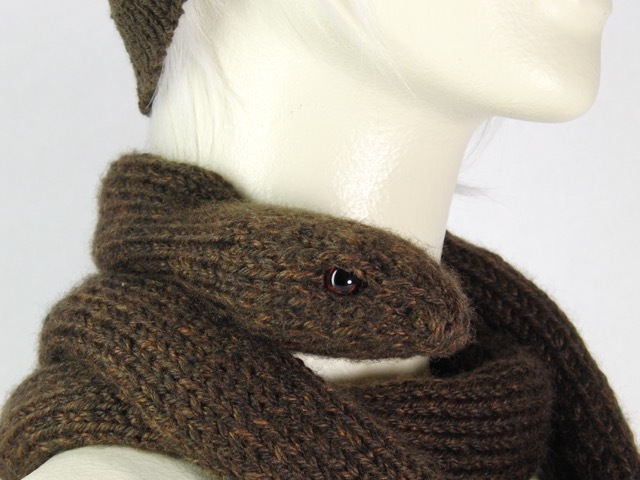 I'm not calling this a realistic knit snake because Ringneck Snakes also have a bright colored ventral side. This is black all the way around. Still, I kind of like it. Here's the details on the new eyes with seed beads. After knitting the 4 black rows for the head run the working yarn through the live stitches with a yarn needle but slip them onto 2 needles instead of pulling it up. Sew to seed beads together with sewing thread and knot it. Leave two long tails to work with. Now back to the nose. The outside needles here are the 4 live stitches on the outside. 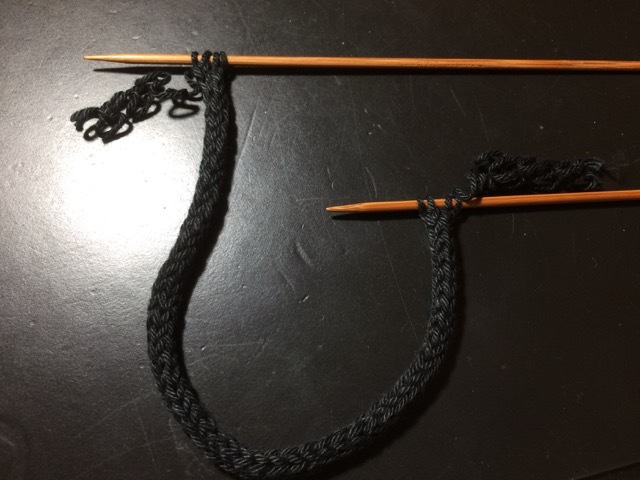 The leftmost loop on the bottom two needles are the working yarn that's threaded through the live loops. The middle needle shows where you're going to poke those two seed beads. Cram them in there under those two loops of yarn. Only the outside of them will stick out, most of the beads are inside the head. 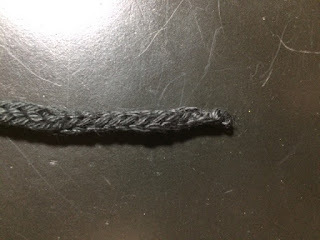 The two loops of yarn will fall into the depression between the beads. Sew them there with the tails of the thread. 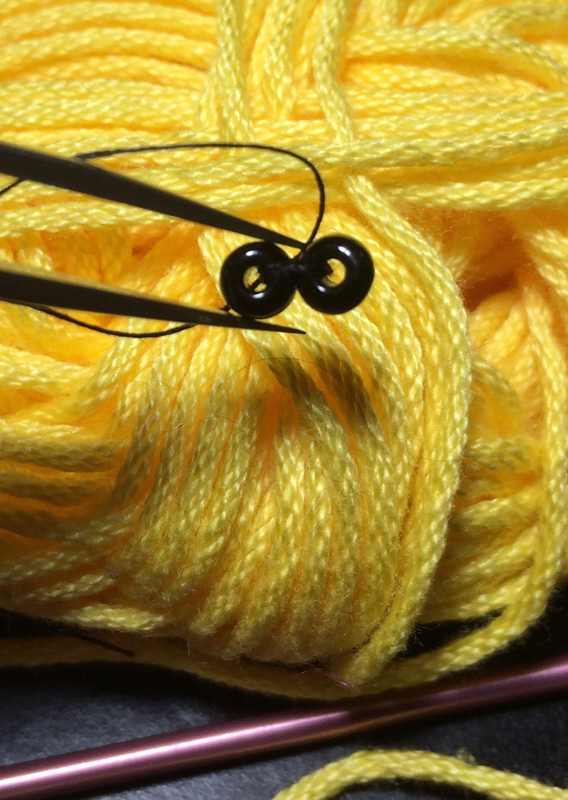 Then run the thread back to the yellow ring so you can use it to sew the tail to the head. Two outside needles hold live stitches. show where the beads/eyes go. Now finish the nose by taking out the needles and pulling up the last four stitches with the working yarn that should be threaded through them already. Work the tail back to the ring neck with a yarn needle. I split the plies and tied a knot back there for extra security. 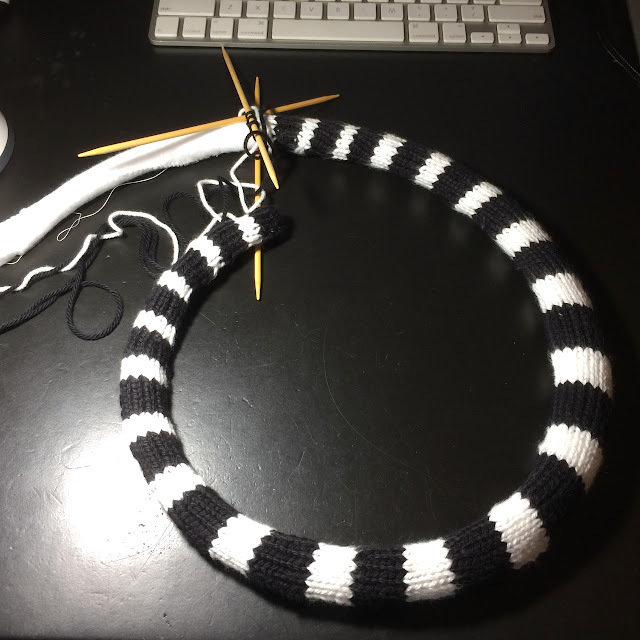 Finally sew the neck to the tail with the sewing thread to hide the beginning/end of the ring. Tie it good and run the tails into the cord. Done! It's a bit bulgy in the eyeballs, but it's passably cute. Also hard to photograph. I would try taking better photos with softer light but I already mailed it to somebody. I'm thinking about doing another one with a duplicate stitched yellow belly. 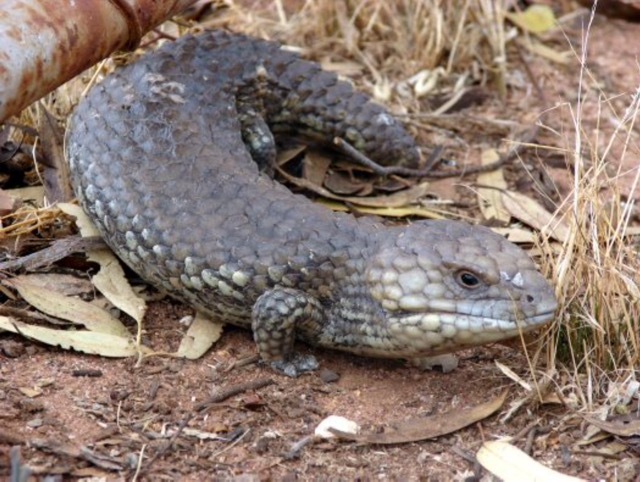 My second Australian reptile pattern is a bobtail skink. This is Ashleigh Wolfe's second study animal. (See Perth's Urban Reptile Ecology for more info) Ashleigh tells me these slow moving reptiles are the Australian equivalent of the tortoises that live in my yard, basking in the sun and observing the world going by without really getting up to much. People in Perth love them. But tortoises do not lend themselves to knitting. 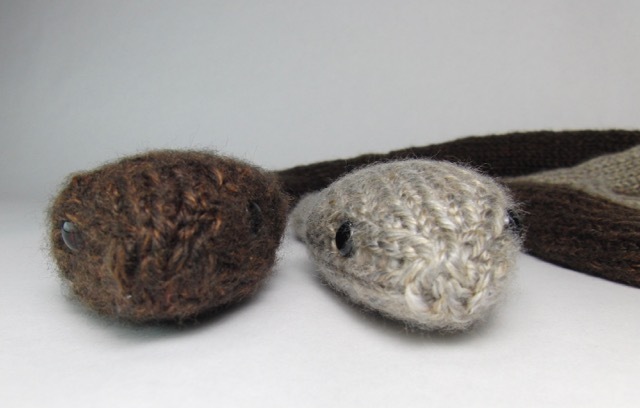 Bobtails are begging to be imagined in bulky yarn. Here's a video of a large number of Bobtails taken from a property to be released back into the wild. I had the perfect yarn in my stash, Hometown USA Little Rock Granite. It calls for a 9 mm needle, US size 13, and is rated as a 6 Super Bulky Yarn. If anybody finds an Australian equivalent let me know so I can update the blog and pattern. I heard from a Raveler in Perth that this exact yarn is available at Spotlight. Huzzah! I also tried an albino version in Los Angeles Tan and an orange striped one in Portsmouth Pumpkin. This toy is actually cuter in the hand than in photos. 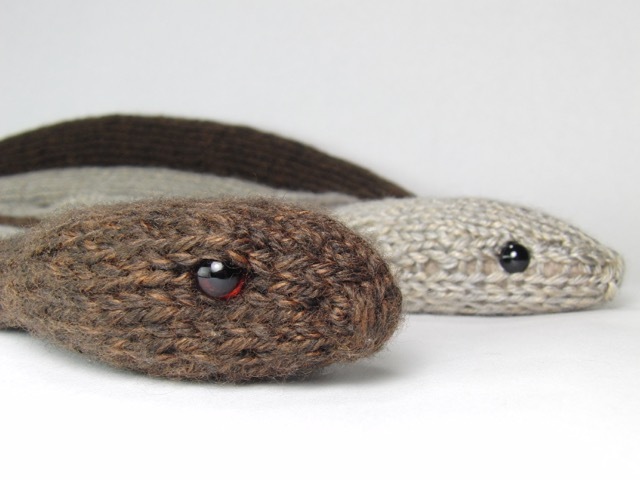 The body is just stockinette knit back and forth the same as the snake patterns. It's kind of resiliently squishy but also bendy, and it stays where you put it if you want to give it a pose. 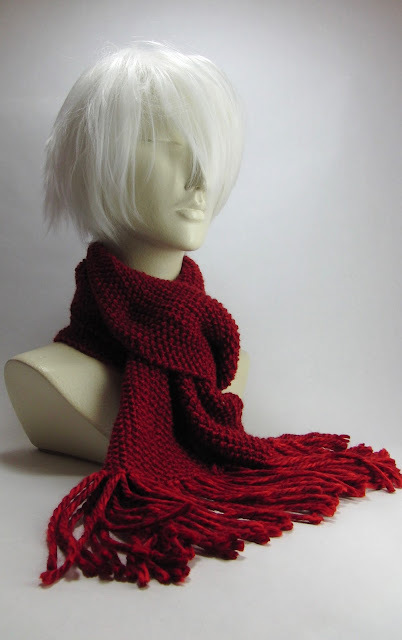 This is a fast knitting project that only takes a few hours and half a skein of yarn. It does take double pointed needles though. The body starts out knit like icord and the head is worked in the round. 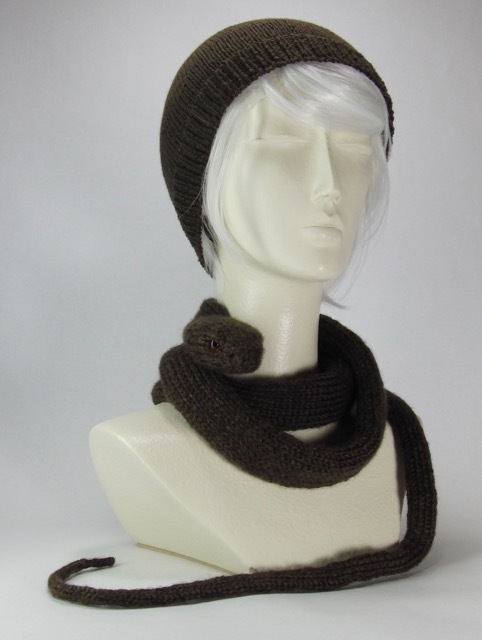 It has a fleece pillow inside like the snake scarves. I tried many ways of doing the legs. The real ones have such tiny legs. I couldn't really make them come out that small in this same yarn. So I just allowed for them to be bigger. I made them like icord then finished the toes with a crochet hook. It was hard to describe in words how to do it so I decided to do a video of the whole thing. Since the whole project can be completed so quickly I didn't split the video into parts. Here's the PDF for download. The minute I saw a picture of a Bobtail I knew I could knit that. That will be my next blog post. I thought I could also do a Dugite similar to the white oak snake. I made the tail longer and narrower and the head and neck have a different shape. 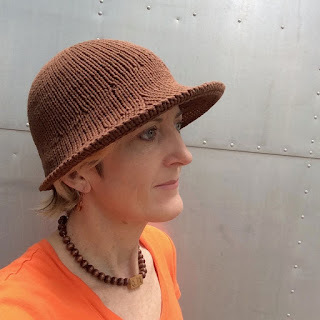 Here's a link to the Dugite pattern on Ravelry. 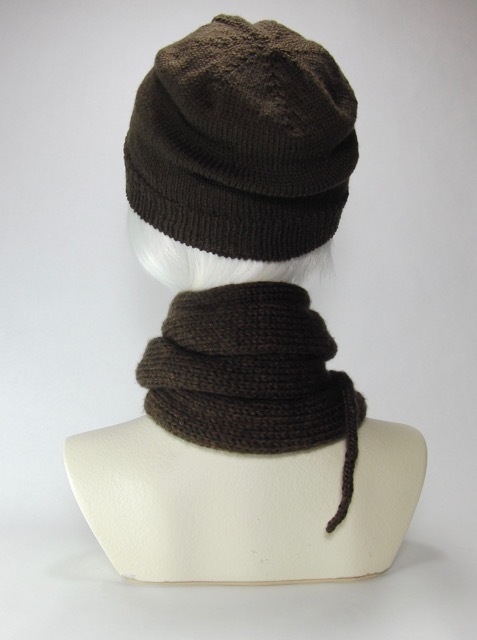 The brown stocking cap in these photos is also my design. I'll be writing up that pattern next month. 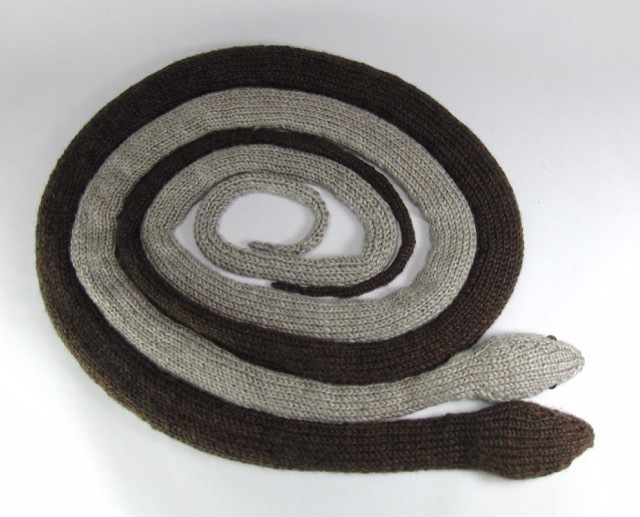 The oak snake is knit on size 8 needles but to get the long fine tail of the Dugite I started with a size 3 needle and went up a needle size every few inches until I got to size 8 to knit the bulk of the snake. I tried to make the icord style tail section 18% of the body length just like a real Dugite. But I made the whole thing longer than the average 1.5 m Dugite so it would make a good scarf. It's over 2 meters long (7 feet). The Dugite's head is similar in width to the neck. The Dugite pattern doesn't decrease as much for the neck. It also has fewer increase rows. 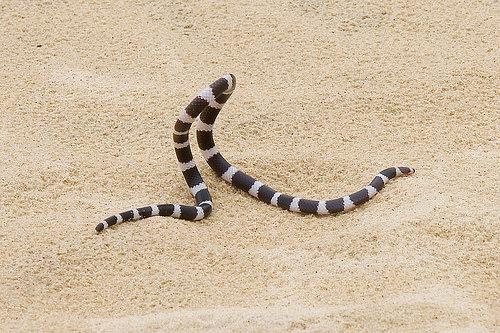 The neck is knit on smaller needles than the body to mimic the smaller scales in the neck of the snake. 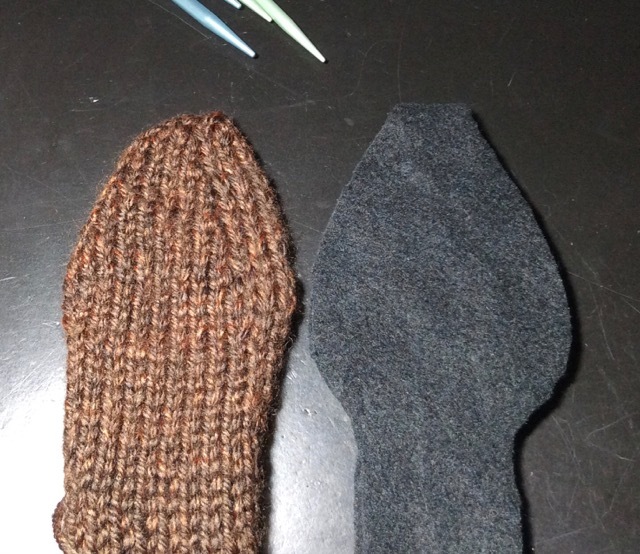 The head scales are much larger though so I went immediately from size 6 to size 8 to knit the head. 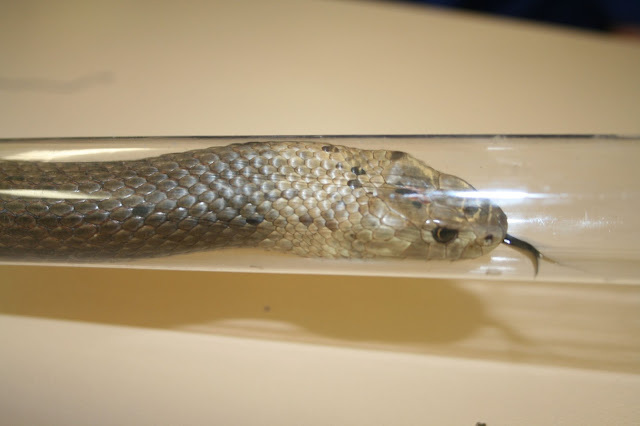 The Dugite head has four stitches on the sides instead of just two for the White Oak Snake. The Dugite has 10 mm topaz glass eyes. The White Oak Snake has 9 mm plastic safety eyes. 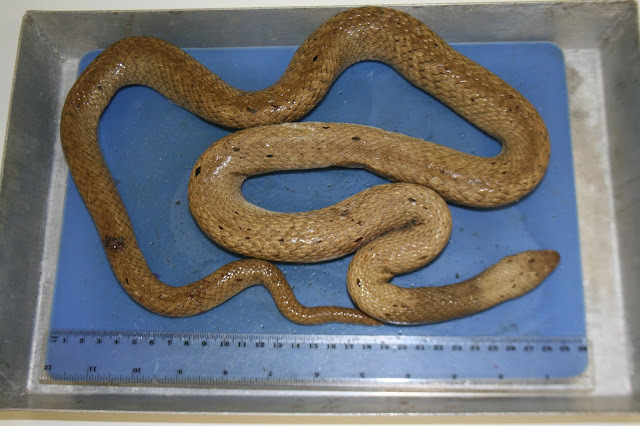 Both snakes have grafted noses. The body of the snake is not stuffed. The heads have fleece pillows inside to hold the stuffing. At the end of knitting the head I grafted the last stitches together. I used a third needle keep the tension the same for the graft. After all the knitting was done I did the finishing work on the head of the Dugite. I was trying to make it as much like a Dugite as I could. 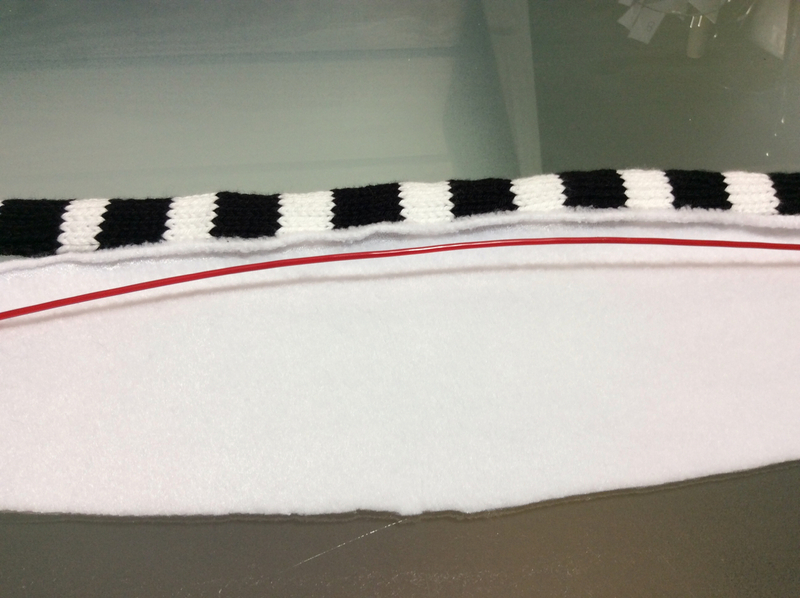 I traced the knit head onto some black fleece. I folded it over at the nose and didn't cut that part. I sewed up the sides. This is exactly the size of the knitting flattened out. The fleece is stretchy so it will expand with stuffing. I ordered the eyes for the Dugite online from CR's Crafts. They are 10 mm medium topaz glass eyes, pre-looped. They're $2.46 for a pair. After finding the right spot for the eyes I ended up pulling the stuffing out of the head so I could get the wire loops through the inner fabric. I sewed the black fleece around the wires before I ran heavy duty thread between the eyes to hold them the right distance apart. This part is admittedly tricky. The safety eyes are a lot easier. After stuffing the head again the fabric failed to stick out above the eyes like I wanted. I had photos I was trying to match (see the end). 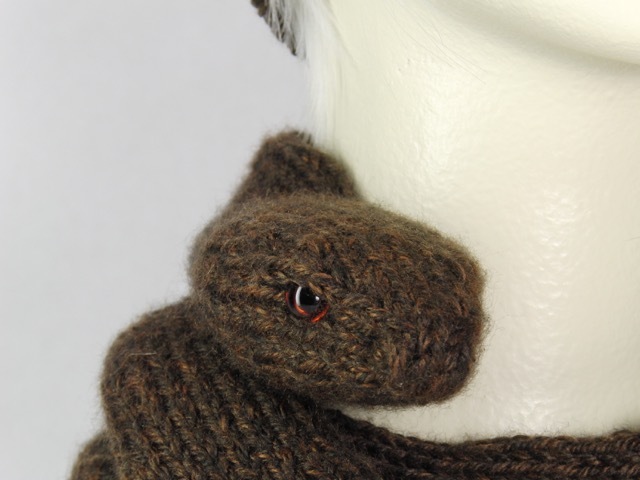 I decided to add a sort of leather patch between the fleece and the knit to hold the knit fabric out to make the kind of snake eyebrows a Dugite has. 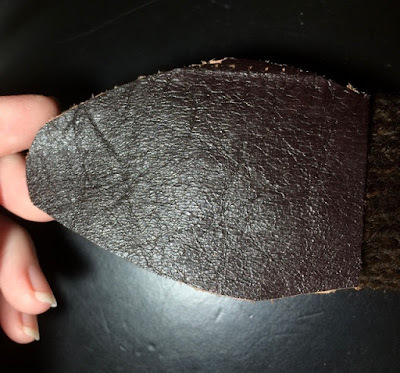 I had some leather from a jacket I had in high school. I kid you not, I have been carrying this leather around for 30 years in my sewing box. Head shaped leather patch held over stuffed knitted head. I actually ended up making this again with folded over bits at the sides sewn down to make it extra stiff over the eyes. I forgot to take another photo. I don't feel like pulling it out again. Although I will suggest to Ashley that she pull it out before she washes the scarf. There's a leather patch inserted into the head to hold out the eyebrows. 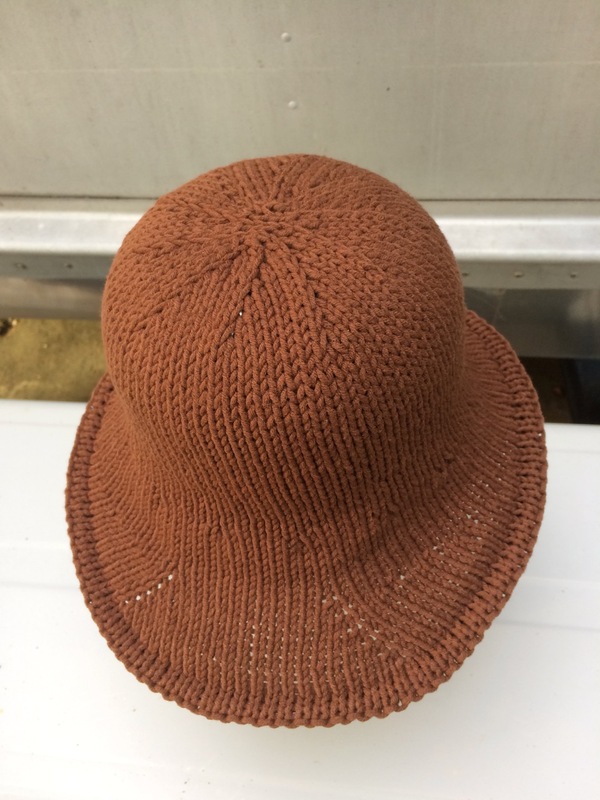 This brown hat is superwash merino wool and nylon sock yarn. I've already shot a video of how to make it. I'll write up the pattern soon. Those eyes look so real. 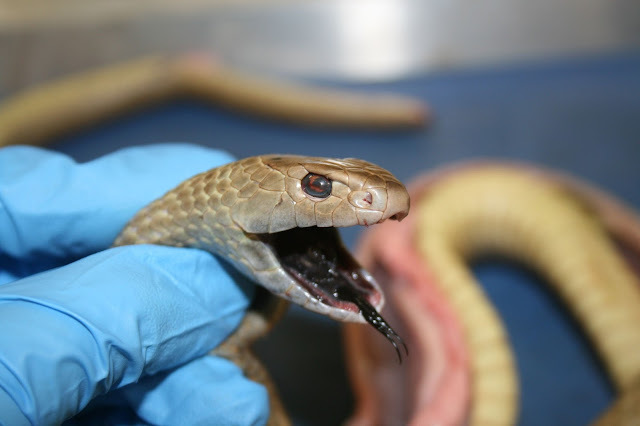 Photos of real snakes coming up. Stop scrolling down if you don't want to see the real thing. but I just had to give up on trying to achieve that. This snake has a GPS transmitter on its tail. 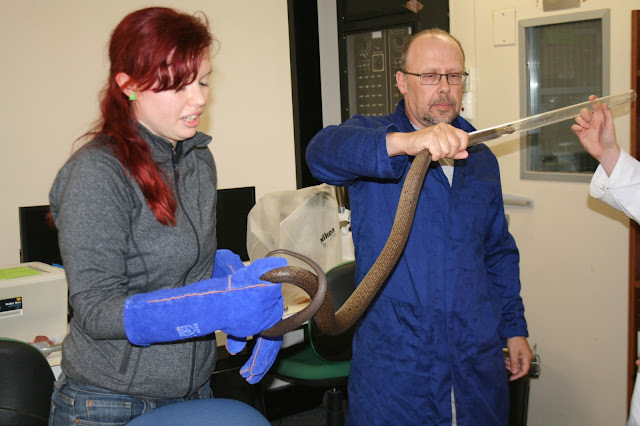 Notice how carefully Ashleigh and her colleagues handle Dugites in the lab. 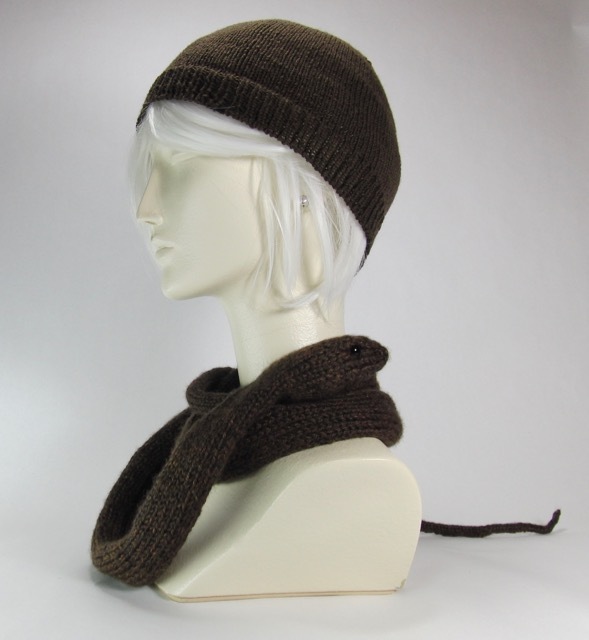 But a knit Dugite scarf goes great with a nice brown handbag.